Inkpress Clear Adhesive Film Roll (24"x75') can be applied onto most surfaces. The film dries instantly, is fade-resistant and water-resistant, making it ideal for POS and event signage, both indoors and outdoors. 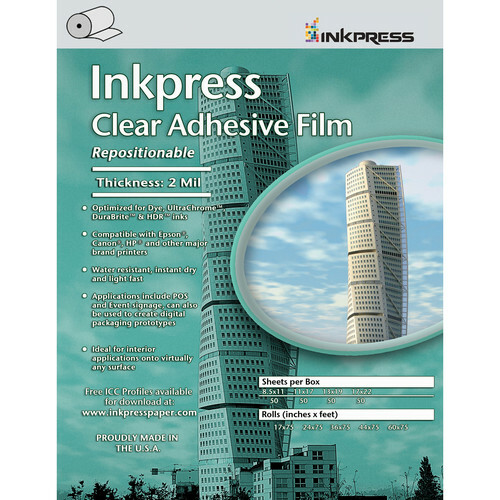 The film is compatible with most major brand printers including Canon, Epson, and HP. Applications include POS and event signage. It can also be used to create digital packaging prototypes. Box Dimensions (LxWxH) 25.8 x 5.5 x 5.1"
How easy is this to remove from the surface it is stuck to? I just checked, it is fairly easy to pull off..